2 halves scored in 3 wedges each (primarily for school foodservice). Save valuable employee hours with this safe, fast and versatile machine. 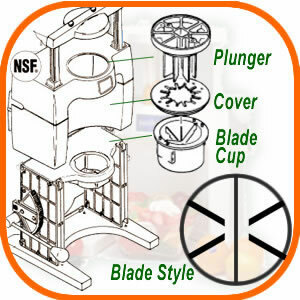 The Sunkist Sectionizer makes quick work of slicing, halving, and wedging a variety of fruits and vegetables. In addition to sectionizing citrus fruit, you can use this machine to core and wedge apples and pears. It will also slice firm tomatoes and mushrooms for sandwiches and pizzas, or wedge them for salads. Our sectionizer can slice and/or wedge hardboiled eggs, kiwi fruit, small to medium potatoes, strawberries; just about any firm (not hard) fruit or vegetable without pits that will fit through the blade cup. It is as simple to use as pulling a handle, and is much safer than cutting fruits and vegetables with a knife. Comes with your choice of one of seven different blade cups; additional ones may be purchased separately. Blade cups and plungers are dishwasher safe for thorough cleaning. Weighs 13 pounds. Made of sturdy ABS plastic. Approved by NSF International. The Sunkist Sectionizer makes the job of cutting orange wedges a breeze. After rinsing with cool tap water, just place an orange in the flexible cup cover and press down the handle. With little effort or skill you have four, six or eight orange wedges ready for garnishing plates or for easy eating. You can expect to section 10 to 12 cartons of oranges per hour. Just choose the size of wedge you want and drop in the appropriate blade cup. An optional 3-in-1 blade cuts an orange in half and scores each half into three wedges - ideal for school foodservice. To make fresh orange "smiles" with a wedge blade in the sectionizer, place the orange, stem end to the side, and press the handle. Fresh orange "smiles" are popular with children and adults alike.